This is the East L.A. Stake Center. In 1981 I was baptized a member of the Mormon church in this building. 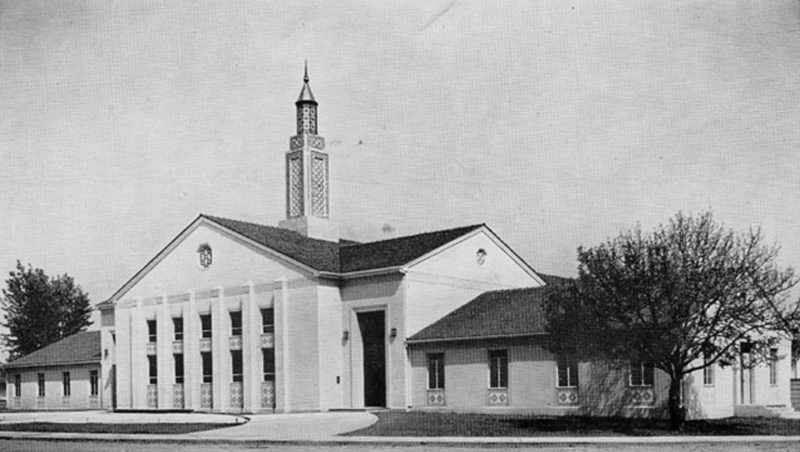 This picture is from 1954, but the building hasn’t changed much since. This is the question that I continue to ask myself. If I am not sure about some of the church’s truth claims, don’t believe others, and disagree with many of the church’s policies, am I still a Mormon? One of my professors in college once said something that has always stuck with me; “It takes about 20 years for a liberal to become a conservative.” He said that in the context of discussing change—particularly meaningful change. I made a commitment to prove him wrong, but when I look at my current political views, and general perspective on life, I am pretty conservative—a HUGE distance away from the liberal, borderline radical views and perspectives that I held when I was younger. To a large degree my professor was right (at least about me). The thought occurred to me that if I transposed the terms Mormon and anti-Mormon in his statement, it would be true as well. In almost every regard, the twenty-year old version of me would consider the forty-four-year old version of me an anti-Mormon. But how did it happen? It certainly happened the way my professor described change—very slowly—and it took about as long as he predicted. My mission president put it this way. “…It will happen the same way as the dew comes in the morning” meaning that change would happen so stealthily that it would be invisible. Of course my mission president was talking about how a testimony of the Book of Mormon/LDS church develops. He would be flabbergasted if he heard me apply his description to the transition from Mormon to anti-Mormon. To be honest, I don’t even know what that phrase means (anti-Mormon). I was always taught to never seek truth from anti-Mormon literature. But no one ever defined what made anti-Mormon literature anti-Mormon. I classified things and people ‘anti-Mormon’ the way others around me did. I knew that Jerald and Sandra Tanner were anti-Mormons and anything they wrote or said was anti-Mormon. I knew that the Mormon Research Ministry (MRM) was an anti-Mormon organization, as well as Saints Alive in Jesus and Ed Decker, just to name a few. The more I was told to stay away from their writing, the more curious I became. I read anything I could find and by the time I was a Mormon missionary I was familiar with almost all the major arguments against Mormonism. But 100% of it were lies, deception, half-truths and just plain old insults—that’s how twenty-year old me interpreted what I read. Over the last four years I’ve gone back to read some of the research by the Tanner’s, MRM, Ed Decker and others. While I still feel that Ed Decker is mostly interested in sensationalism, I do recognize that my conclusions are more in line with the works that I once dismissed as anti-Mormon than with the LDS church. But does that make me anti-Mormon, or simply a disgruntled Mormon? I need an answer to placate my brain. It’s true that my attitude, beliefs, and opinions clash with Mormon orthodoxy, but I am neither Mormon, anti-Mormon, or non-Mormon. That answer will likely change as I change, but for now it is good enough. Hymns are about the only aspect of religion that I trust to NOT trigger anxiety. This one—this particular arrangement—is one of my favorites.